Rocky called me about building a transom for her home in Semmes, Alabama just west of Mobile. 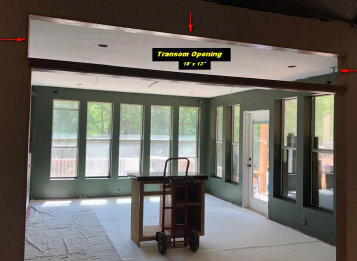 After living in her house for 20+ years she and her husband were doing a complete remodel and were adding a magnificent Theatre room (complete with a popcorn machine) and a Pool room. She had an idea for a pool oriented transom between the two rooms. A photo is on the right. Since they were just an hour away, I drove to visit them. Her husband Keith and I discussed size possibilities for a transom. He then created a 10' wide x 13" opening and we agreed to build a 3 piece transom with a 5' central transom and a 2 1/2' transom on each end. I left Rocky with a box of several hundred glass samples. Over the next few months, we evolved the current design. Rocky has a very creative flair and carefully chose every color. This was challenging project because it had over 300 pieces and had a lot of complicated glass cuts. Photo of Rocky's Transom lit up on my fluorescent light box. Photo of Rocky's Transom taken outside in sunlight.